If you require a sound system to play background music or make announcements in an office, warehouse or retail space then we have you covered. Sound has an impact on customer behaviour and can be a major part of any marketing strategy. With years of product knowledge and experience supplying and installing commercial sound systems we can provide the ideal solution. 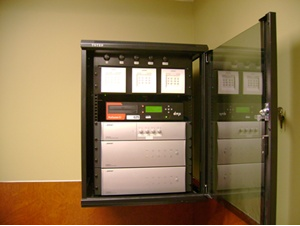 AV Solutions will custom design a unique paging system that incorporates background music and paging to single or multiple zones to meet your specific requirements and environmental conditions - a system that offers ease of operation as it enables the user to make clear, crisp, controlled voice pages. Our commercial/education Sound System Solutions Include:Public address audio used in gym's, theatre's multi-purpose rooms,Churches, etc. AV Solutions can assess, design and recommend the ideal system for your location. Our expertise is with solid, reliable systems that do not require an audio engineer to operate; perfect for presentations, meetings and public use spaces.